I promise – I will stop posting about house decor as soon as my bedroom is done. LOL! In the meantime, I cannot help it. I spend most of my downtime searching for this sort of thing. I’m not so sure I plan on reintroducing a mirror back into my bedroom, but if I did… it would be this one from West Elm. 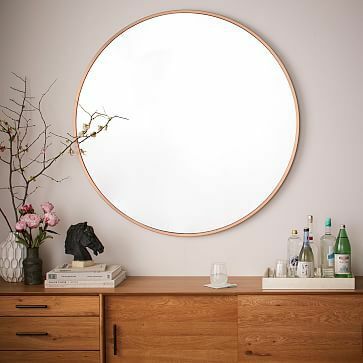 The Metal Framed Oversized Round Mirror comes in Rose Gold which you know I am all about and would actually look great next to my mounted TV. I need to sleep on it???? It’s a bit of a splurge at $350 but it is gorgeous and I think worth the price tag. Our best-selling Metal Framed Wall Mirror gets oversized and updated with a fashionable finish. Its subtle frame adds a finished touch to any room. 48″”diam. x 1.5″”d. Mirrored glass. Metal frame. Do you have a mirror on your bedroom wall? We had a huge rectangular one for more than a decade and we finally got rid of it two years ago because I thought it was just unnecessary. Neither one of us ever looked into it. It was almost awkwardly placed – too high to use on a day to day basis and it really wasn’t helping with making the room feel bigger. If I bought this round mirror, I would place it lower and make it literally functional. Something I could use to put makeup on or to check my hair while my husband has control of the bathroom. You know how men are… 8 hours a day. UGH. I think if you are searching for a bedroom mirror, this is a great pick. As for me, I’m still on the fence, but marking this post for future reference.